Mallard ducks are one of the most abundant and widely-distributed wild ducks in the world. Despite being so common, I love these little waterfowl. 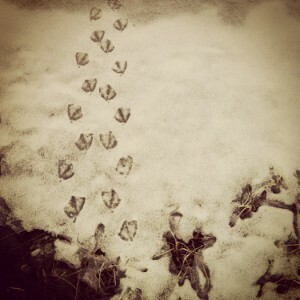 These adorable little duck footprints were left in a late winter snow … evidence of the ducks we couldn’t see. The male is unmistakable during breeding with his glossy green head, while the female has beautiful patterning in (mostly) brown feathers. It’s said the female lays more than half her body weight in eggs with the clutch being between 8-13 eggs. 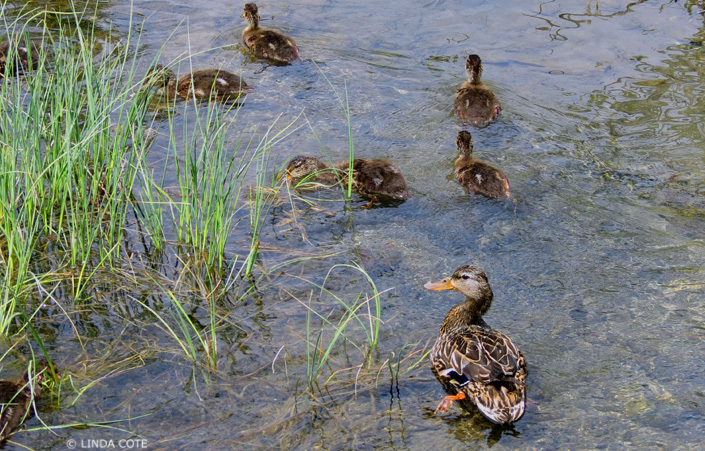 There is nothing cuter than seeing a mother duck with all her little ducklings trailing behind. The ducklings can swim as soon as they hatch, but they stay close to the mother for protection, learning about their habitat and finding food. Their habitat is varied — from urban gardens to ponds and lakes — and and is chosen for its ability to help to conceal the ducks from nearby predators. 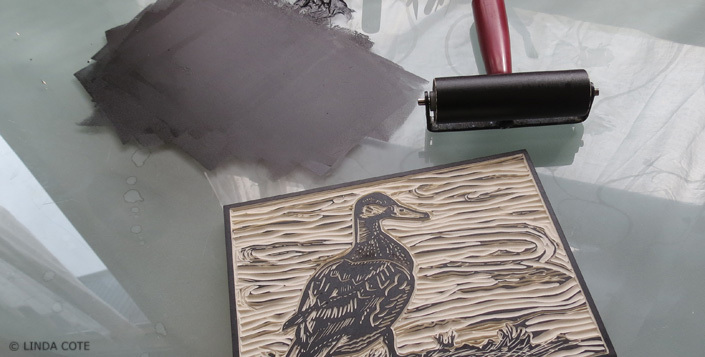 My love of mallards had me wanting to capture their beauty with a new print. 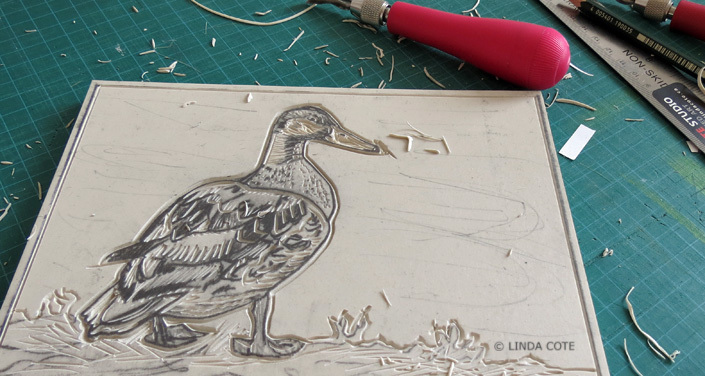 “Little Mallard” is now the most recent edition in my “little bird” series of handmade prints. 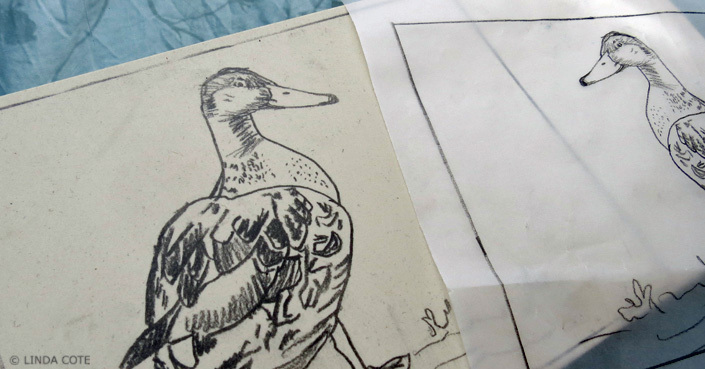 Below is my process for creating my “Little Mallard” print. It all starts with a sketch on tissue paper, that is then transferred to my block, the soft linoleum I use to carve my artwork. 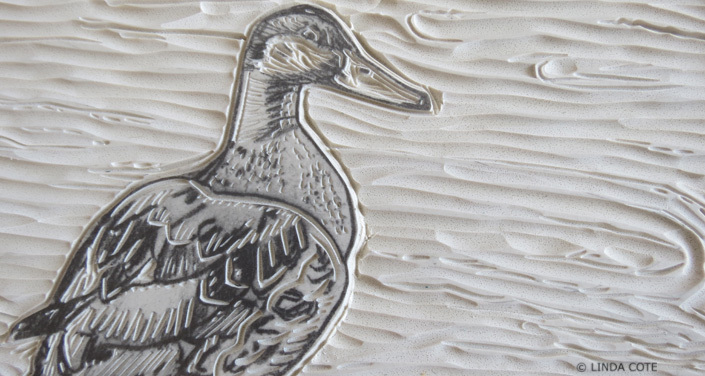 The beginning carving separates the duck from the background. 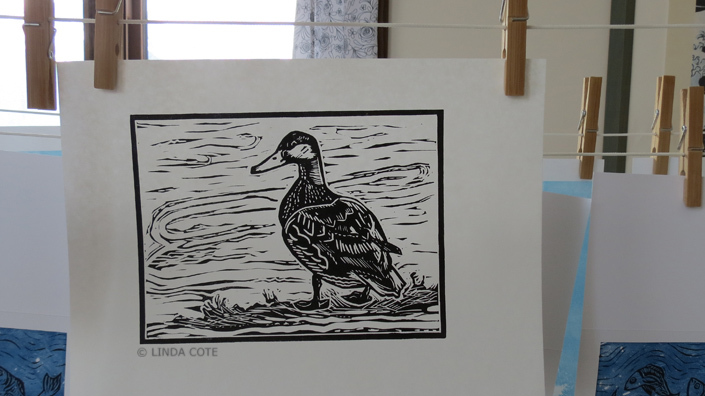 More progress…I make the background strokes swirly to depict the water flowing behind the duck. Detail of the carving … almost done! Once the base art is carved, I ink up the block, and for the first time, get to see what I’ve created in black and white. Pulling the first test print is exciting. From here, I usually make small adjustments to the piece, removing a few more lines, and cleaning up the background carving marks. 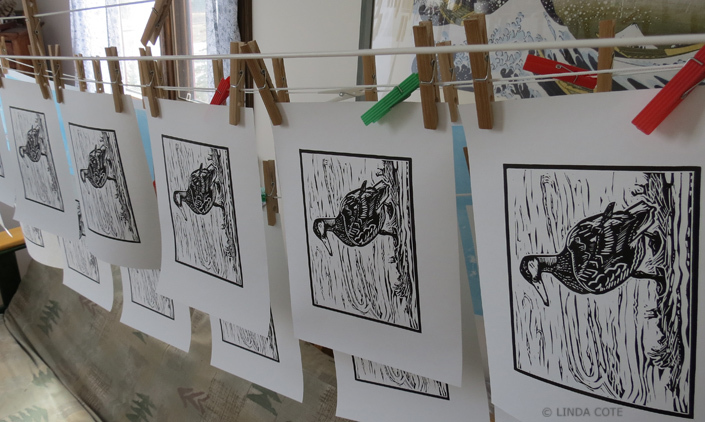 The print hangs on my art studio clothesline to dry for about a week. 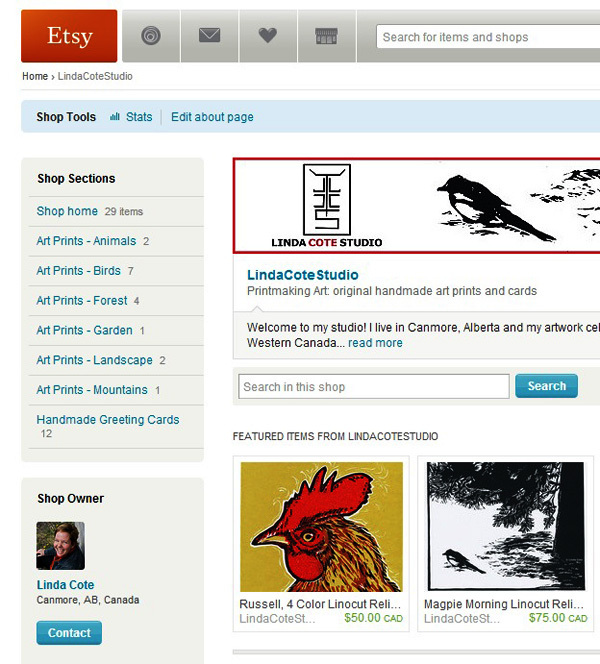 I use an oil-based printmaking ink that is a lovely dense black, and once it is dry, it’s permanent. This edition comes to 30 prints in the end. It’s one of my favorite things: to see all the prints hanging in a row! 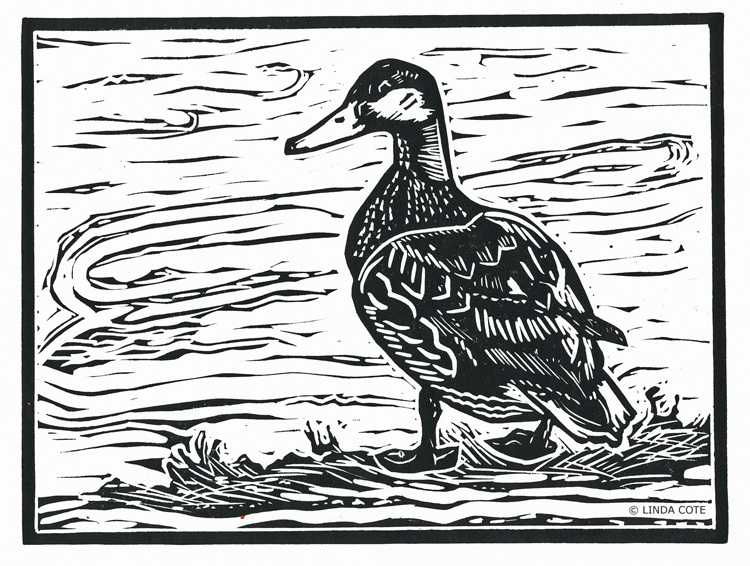 Here is the final “Little Mallard” print. The mallard is watchful — likely because there are ducklings nearby. When my youngest child was born, a friend gave a sweet book to his older brother, then almost 3 years old. It was one of her favorites growing up, called “Make Way For Ducklings” by Robert McCloskey about a duck family who makes its home in a park in central Boston. 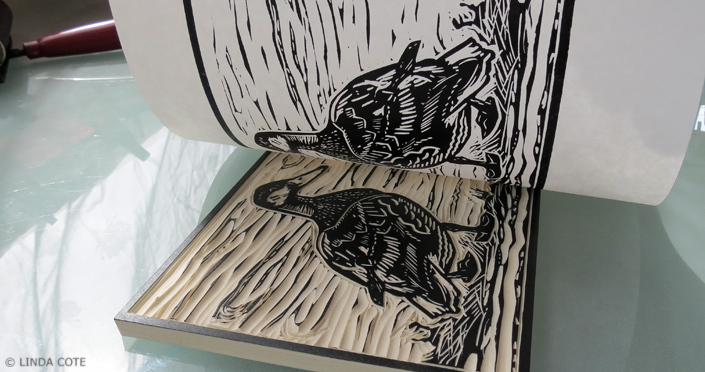 It’s a lovely book with great illustrations; a wonderful read if you also love ducks. 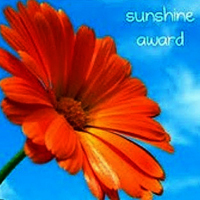 What a little cutie, and what a nice image to wake up to… a gift on a cold gray morning! Thanks, Sophie! These ducks always cheer me up when I see them. Well, any duck really!